You have hypothyroidism when the thyroid gland does not make enough thyroid hormone. 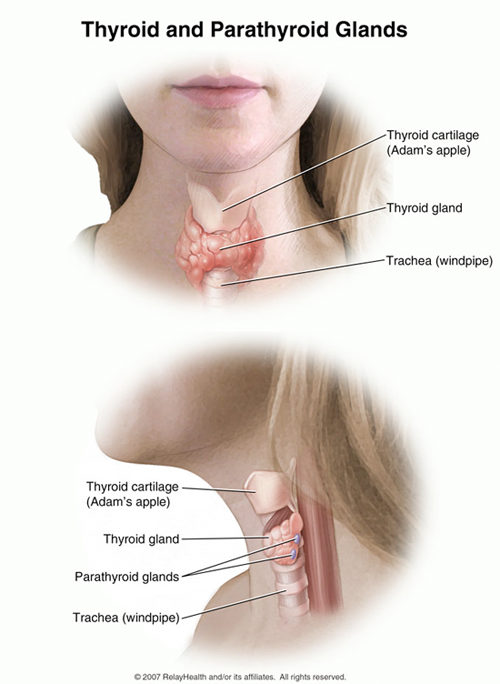 (The thyroid gland is in the front of your neck.) Having too little thyroid hormone causes many symptoms. If you have any of these symptoms, tell your healthcare provider. Have heavy or long menstrual periods. You feel cold a lot of the time. Your hair may be coarse or dry, or it may turn gray at a young age. Your tongue may get thick. Your eyelids may be swollen. Your voice may deepen or grow hoarse. Swelling of the thyroid gland (which is called a goiter). Loss of consciousness or even a coma. You have a disease, often a virus, that causes your thyroid gland to swell. Your brain isn't signaling your thyroid to make enough hormone. Your thyroid gland has been exposed to radiation during cancer treatment. Often it is not known why the thyroid gland is not producing enough thyroid hormone. Your healthcare provider will ask about your symptoms and examine you. You will have blood tests to measure the thyroid hormones your body makes. Your healthcare provider will prescribe thyroid hormone medicine. This will take the place of what your body would normally make. After you take the hormone pills for about a week, you will feel better. You will have another blood test to make sure you are taking enough hormone. After a few weeks, you should have no signs of the disease. Most likely, you will need to take your pills every day for the rest of your life. You will need to have a blood test to check your thyroid hormone level every few months for the rest of your life to make sure you are getting the right amount of thyroid hormone. As your body changes with time, the amount of medicine you need can change, too. Take your pills every day, exactly as prescribed by your healthcare provider. Follow your provider's instructions for getting your thyroid hormone level checked regularly. See your healthcare provider if any of your symptoms are not getting better or they come back.